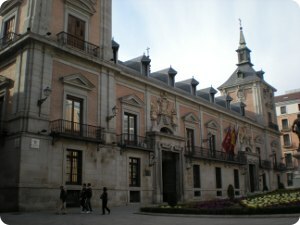 The current City Hall of Madrid is the Communications Palace ("Palacio de las Comunicaciones" in spanish). It is a magnificent building situated along the south side of the Cibeles Square. 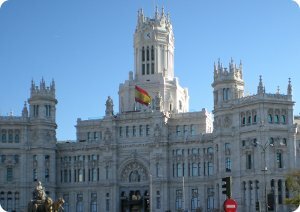 In 2007 the building was transformed into the new home of Madrid's city council. Even though Madrid's city hall looks like a high-gothic cathedral, it was originally built in the early 20th century as the main office of the Spanish postal service, hence its name Communications Palace. It continued to serve that purpose for about a century until November 2007 when it took over the function of city hall from the much less impressive "Casa de la Villa" at the Plaza de la Villa Square. Its architecture is a combination of the gothic style with neoclassical elements. The building's facade is elaborately decorated with cartouches and pilasters. Long pinnacles adorn the top of the towers, the tallest of which reaches a height of about 40 meter. * Line 2 - Banco de España station. The old City Hall of Madrid was the "Casa de la Villa", situated in the charming historic Plaza de la Villa Square, between Puerta del Sol, Plaza Mayor and the Orient Square. This square was one of the focal points of activity in mediaeval Madrid. Several important buildings are also located in the Plaza de la Villa, one of the oldest plazas in Madrid. The oldest building is the Torre de los Lujanes, built in the Gothic style in the fifteenth century. Another building, the Casa de Cisneros, was built in 1537. Alongside it is the the old town hall. It was built by the architect Juan Goméz de Mora, designer of the Plaza Mayor, and it is architecturally similar with a relatively austere red-orange facade and mansard roof, and steep-roofed corner towers. * Lines 1, 2 or 3 - Sol station. * Lines 2, 5 or R - Opera station.